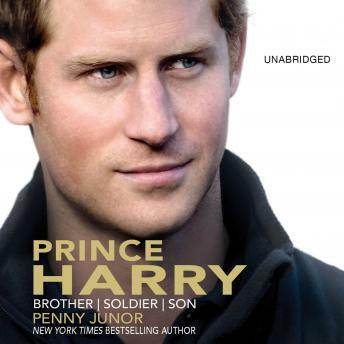 The authoritative biography of Prince Harry by noted royal family biographer Penny Junor, author of Prince William: The Man Who Will Be King and The Firm: The Troubled Life of the House of Windsor. Prince Harry, one of the most popular members of the British royal family, has had a colorful life. After losing his mother at 12 years old, he spent his teenage years making questionable choices under intense international media scrutiny, becoming known for his mischevious grin, shock of red hair, and the occassional not-so-royal indiscretion. As he's grown, he has distinguished himself through military service, flying helicopters for the RAF. He served in Afghanistan and continues to devote himself to his military career. He also follows in his mother's footsteps with charity work--he is the founder of Sentebale, a charity to help orphans in Lesotho, and works with many other charitable organziations to help young people in society and to conserve natural resources. As he reaches his thirtieth birthday, Prince Harry is proving himself a prince of the people. With unprecedented access to the most important figures in his life, Penny Junor is able get the truth about who this mercurial and fascinating royal son really is. A modern biography of a modern prince, this book offers an insider's look at the life of the man who is fourth in line to Britain's throne.